In the current era of research, it has become indispensable to keep pace with the new methods of measurement. The researchers in the medical field often face a need to compare two methods of measurement; this could be a new method to be compared with an existing method; simply due to alignment issues between instruments, there is a requirement of some tool to measure and appraise the differences or checking a new method with a gold-standard test. Here, one should be cautious that whenever a variable is measured through an instrument, there is some degree of implied error and often no instrument can be 100% accurate. In spite of this, there arises a need to ensure that there is an agreement between the two methods, new and existing one and/or two available tests. The dilemma remains how to assess the agreement, and there is often confusion between correlation and agreement. The main difference is that correlation tells about the strength of the linear relationship between two variables, not the differences which actually limit of agreement tells. However, it is important that the two methods that are designed to measure the same variable should have good correlation. The correlation is often represented by the correlation coefficient (or “r”). The value of r varies from −1.0 to +1.0 where closer the coefficients are to +1.0, greater the strength of the linear relationship. For agreement, Bland and Altman introduced a plot to illustrate the agreement between two quantitative measurements. In the following section, the basics of the plot would be described in detail. Bland–Altman plot is a graphical method to plot the difference scores of two measurements against the mean for each subject., This is basically done by studying the mean difference and constructing limits of agreement. The plot is solely meant to define the intervals of agreements, and it does not say whether those limits are acceptable or not. The acceptable limits must be defined before, based on varying factors of clinical, biological, and other considerations., The duo Bland and Altman defined limits of agreement using a simple formula using the mean and the standard deviation (SD) of the differences between two measurements. There is a hypothetical situation in a laboratory where a test is being done on twenty adolescents. The prerequisite is to measure the weight of all the adolescents in kilograms, which is a critical parameter for the final conclusions from the test. 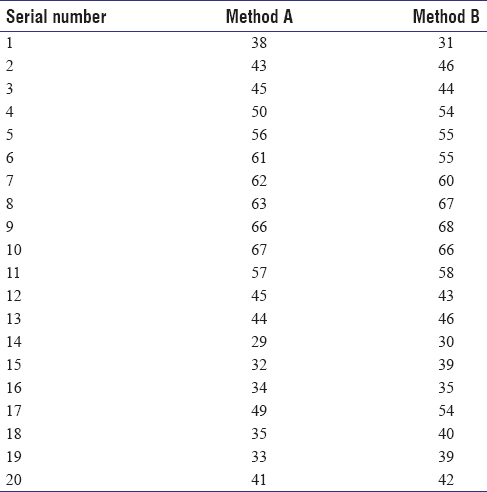 There are two methods available - A and B (results from both measurement scales is represented in [Table 1]). The r = Pearson correlation of both methods is 0.95 with P < 0.001. This is suggestive that the correlation is significant, thus, there is a positive relationship between the two methods A and B. This establishes correlation among the tests but may not necessarily depict agreement. There would be an agreement only if the points lie perfectly along the line of equality. A change in scale of measurement does not affect the correlation, but it affects the agreement. This is basically the calculation that we are estimating the difference between the two methods compared to mean of the two indicating the best measure of “true value.” As mentioned in the explanation about plot, limits of agreement would be defined. 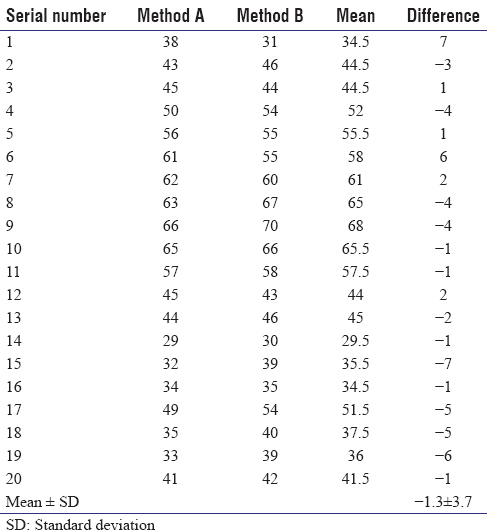 From our example [Table 2], the average of the differences is −1.3 units. The data suggest that on average the second method (B) measures 1.3 units more than the first one as mean difference is nonzero. The three lines in [Figure 1] represent mean of differences - called bias and rest two lines are limits of agreement mean +1.96 SD and mean −1.96 SD. In this example, many points lie outside the limits. To interpret the results, it is important to decide a priori about the level to which the error would be acceptable to the researcher. Further with reference to this example, more than 50% of the values lie outside the limit which indicates that there is no agreement between the tests. As a general rule implied goals whether biological or clinical goals could define whether the agreement interval is wide or narrow for any purpose. Figure 1: Bland–Altman plot with lines of agreement. This analysis can be done in Excel, SPSS (SPSS for Windows, Version 16.0. Chicago, USA, SPSS Inc.), and other online calculators easily. The presented exercise was plotted through Excel wherein using “data analysis” under “data” tab. In case, “data analysis” is not there by default, then it can be added from add-in option through “file” tab. Under “data analysis” pack, the regression should be selected as it would not only give r but also P value [Figure 2]. Figure 2: Output in Excel after following the steps mentioned in the text. Highlighted portion depicts r (yellow) and P (gray). 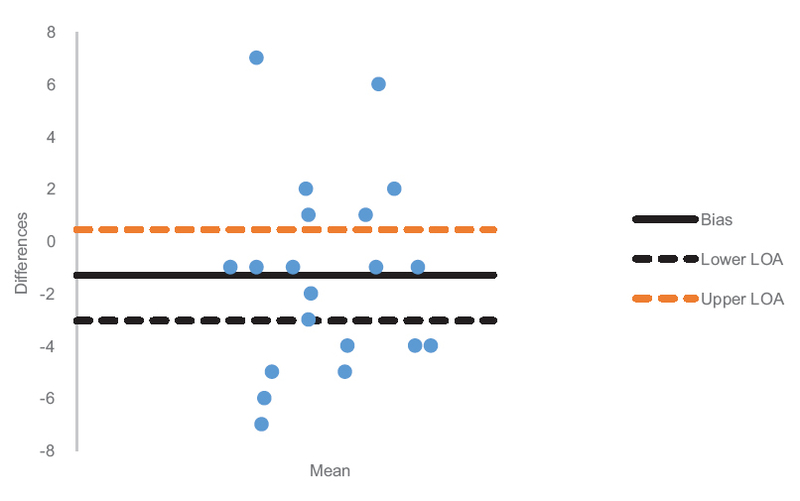 After this, as shown in [Table 2], calculate mean and difference column and using “insert” tab, add scatter plot chart option. 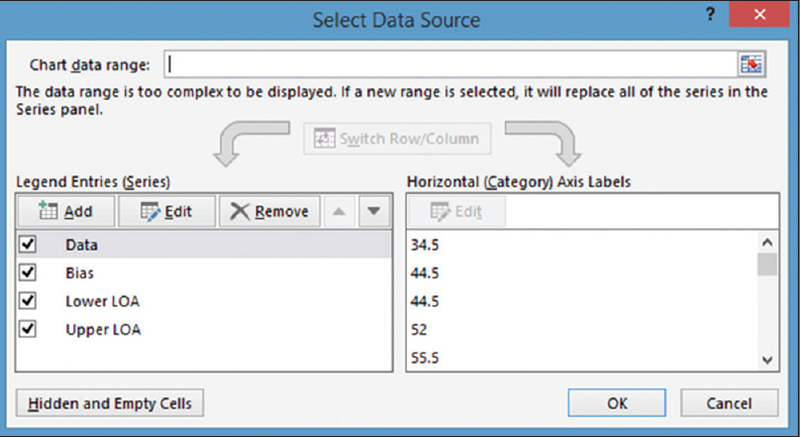 The option of “select data” would enable adding lines of agreement to the plot. The following screen would appear once the required data points have been selected [Figure 3]. Figure 3: Data analysis screen shot. The Bland–Altman plot is a useful graphical representation of the agreement between the two tests or measurement tools. The interpretation can depend on the predetermined conditions and requirements. Taylor R. Interpretation of the correlation coefficient: A basic review. J Diagn Med Sonogr 1990;6:35-9. Altman D, Bland J. Measurement in medicine: The analysis of method comparison studies. The Statistician 1983;32:307-17. Giavarina D. Understanding Bland Altman analysis. Biochem Med (Zagreb) 2015;25:141-51. Dewitte K, Fierens C, Stöckl D, Thienpont LM. Application of the Bland-Altman plot for interpretation of method-comparison studies: A critical investigation of its practice. Clin Chem 2002;48:799-801. Sedgwick P. Limits of agreement (Bland-Altman method). BMJ 2013;346:f1630. Earthman CP. Body Composition tools for assessment of adult malnutrition at the bedside: A tutorial on research considerations and clinical applications. JPEN J Parenter Enteral Nutr 2015;39:787-822.